Why investing in Mental Health in Europe? The need to include mental health among the first priorities of the public health agenda has been increasingly recognized in Europe over the past decades. This recognition is based on the existing evidence on the magnitude of mental health problems in European countries. Mental disorders are highly prevalent in Europe and are a major burden on society. According to estimations of WHO they affect every fourth citizen at least once during their life and can be found in more than 10% of the European Union (EU) population during any given year. Neuropsychiatric disorders are the second leading cause of disability-adjusted life years (DALYs) in the WHO European Region, accounting for 19.5% of all DALYs. According to Eurostat, suicide remains a significant cause of premature death in Europe, with over 50.000 deaths a year in the EU. Nine of the ten countries with the highest rates of suicide in the world are in the European Region. There is also an association between mental health problems and losses of productive human capital. EU mental health surveys revealed that there are substantial costs associated with mental disorders, such as higher presenteeism and absenteeism or significantly reduced earnings among those with a mental disorders, which also are the leading cause for people receiving work disability benefits. On the other hand, there is increasing data proving that positive mental health and well being is a key factor for social cohesion, economic progress and sustainable development in the EU. Mental health is a human right and a key resource for the success of the EU as a knowledge-based society and the accomplishment of the objectives of the Lisbon strategy. Much is now known about what works in mental health promotion, prevention, care and treatment of mental disorders. The challenge is now to implement this knowledge. Services and practice do not always reflect the knowledge of what works in mental health care and treatment. Many countries have limited community-based mental health services and little specialist help for young or elderly people. Many people in large mental institutions are subject to neglect and abuse of human rights, reflected in high mortality rates. Stigma and prejudice are widespread and affect every aspect of mental health, including whether people seek and receive help. Significant efforts have been made by EU and Member States (MS) to improve mental health of the populations. Yet, despite all these efforts, a lot remains to be done. In European countries, at least 30% of people with severe mental disorders do not have access to mental health care, and the majority of the populations don’t benefit from the interventions that have proved to be effective in prevention and promotion. To attain these objectives, a series of thematic conferences were organized, from 2009 to 2011, to facilitate the sharing of experiences and to strengthen collaboration between stakeholders. Finally, giving sequence to all these events, in 2011, the Council invited Member States and the Commission to set up a joint action on mental health and well-being under the health program. The Joint Action for Mental Health and Well-being (JA MH-WB), launched in 2013, aims at building a framework for action in mental health policy at the European level and builds on previous work developed under the European Pact for Mental Health and Well-being. Funded by the European Agency for Health and Consumers, the Joint Action involves 51 partners representing 28 EU Member States and 11 European organizations, and is coordinated by the Nova Medical School/Faculdade de Ciências Médicas, Nova University of Lisbon, Portugal. The objective of the JA MH-WB is to contribute to the promotion of mental health and well-being, the prevention of mental disorders and the improvement of care and social inclusion of people with mental disorders in Europe. promoting the integration of mental health in all policies. This objective will be attained by establishing a process for structured collaborative work, involving MS, EU, relevant stakeholders and international organizations, leading to the development of an endorsed framework for action. Creation of mechanisms supporting a structured collaboration between key actors in the implementation of mental health policies in Europe. 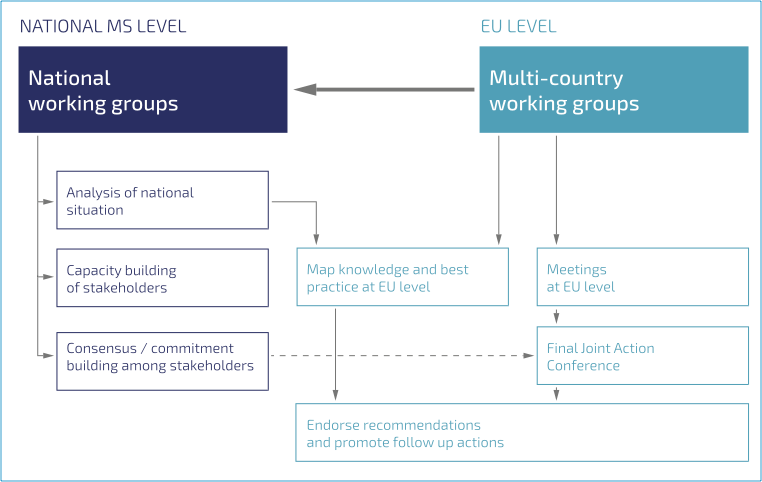 In each of the five areas of work of the Joint Action, a similar methodology was adopted, which includes a situation analysis in participating countries, the development of recommendations for action, and the support to the endorsement of a framework for action by EU and member states. Evaluation of progress made in EU and Members States in each of the five areas of the JA is currently being completed by national and European working groups, integrating policy makers and other stakeholders. With the collaboration of experts, they reviewed the available knowledge and resources resulting from other mental health projects in Europe (toolkits, guidelines, databases, etc. ), and analyzed previous initiatives in order to better identify the ingredients that should be taken into consideration to improve the effectiveness and sustainability of future initiatives. Working methods included SWOT analysis (to evaluate achievements, barriers and challenges in MS), review of literature, questionnaires, and interviews. The development of recommendations for action at EU and Member States level to improve the effectiveness of mental health policies implementation has been made in collaboration with EU agencies, WHO and other international organizations. The same objective will be attained through meetings and other activities at the European level that will contribute to strengthen/create networks. To support the endorsement of the recommendations by Member States and the EU, and promote their commitment for follow-up actions, a final Joint Action conference will be organized in the beginning of 2016. Finally, to build the sustainability of mental health policy initiatives in Europe, a close collaboration was established with other European mental health initiatives, in the research, clinical and policy areas, and a specific strategy will be developed to create the mechanisms that are required to support a permanent, structured and coherent cooperation in mental health policy in Europe in the future. Funded by the Consumers, Health and Food Executive Agency (CHAFEA) / DG Sanco, the Joint Action of mental Health and Well-being is organized in 5 areas of work related to mental health and well-being policy; and 3 transversal working groups dedicated to the management, dissemination and evaluation. Each of these working groups are designated Working Packages (WP). A Steering Committee, comprised of the Coordinators of each working area (work packages) is responsible for the implementation of the Joint Action. An external Advisory Committee includes representatives from the main stakeholders and ensures timely contribution of the whole consortium to the achievement of the Join Action outcomes. Leader: Dóra Guðmundsdóttir, Directorate of Health (DOHI), Iceland. Countries – institutions: Portugal – FCM/UNL, MS-DGS, Spain – MSSSI, Italy – AUSL-BO, Bulgaria – NCPHA, Hungary – SUB, Austria, Luxembourg – MHL, Cyprus- MHC, Greece, MHE, ENUSP, EUFAMI,ESN, Gamian, EUREGHA. Countries – institutions: Italy- AOUI-VR, Malta- MHEC, Croatia- MZRH, Iceland-DOHI, United Kingdom- SLaM, Norway NIPH, Slovakia- SK-MOH, Estonia- ERSI, Finland- THL, European Social Network ESN (Galicia Region, Spain and Botkyrka Region, Sweden), European Regional and Local Health Authorities (EUREGHA), Schools for Health in Europe (SHE), Eurochild, EuroHealthNet, Italian Ministry of Health, University of Cagliari (Italy), State Mental Health Center Lithuania, ADHD Europe, European School Heads Association (ESHA). Countries – institutions: Finland – FAMH, Iceland – DOHI, Norway – NIPH, Portugal – FCM/UNL, United Kingdon –SLAM and SE-Scotland, Denmark – DHMA, Romania- CNSMLA, Lithuania-SMHC, Austria-OBG, MHE, ESN.